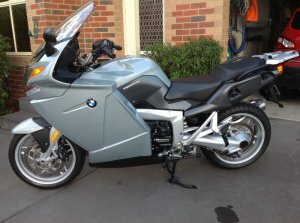 This is one of the best kept K1200GT's (immaculate condition) that you'll find anywhere. The bike is fitted with both Top Box and Side Panniers all lockable, colour to match bike, ignition key fits all, electronic cruise control, heated grips and electronic windscreen, ABS traction control, very comprehensive computer readout giving you status of systems. Even advises how much air you have in tyres. Top Boxes fits two full size helmets. Locked glove box compartment for smaller items. The paintwork is near perfect with no dents or scratches on the tank, frame or plastic bodywork. This bike has only travelled 12,350km’s. The bike has been garaged for life. Serviced by BMW, washed after every ride. Every system on the bike operates without fault. I can negotiate a small amount on price but please refrain from any insulting offers. The bike will be supplied with a roadworthy upon sale. Pick up or purchaser to organise freight. Please call for further information, you will not go wrong with this bike it is as close to a new bike as you can get.